Shop Pearl PCB1030 Primero Rock Cowbell With PPS30 Bracket from AMS and enjoy Fast & Free Shipping. The Pearl PCB1030 Primero Rock Cowbell is not just another cowbell. Can you ever have enough cowbells? Mount the Primero Rock anywhere for instant percussion. The Primero cowbell offers the benefits and outstanding sound quality of the Elite line only at the lower price found at American Musical Supply. 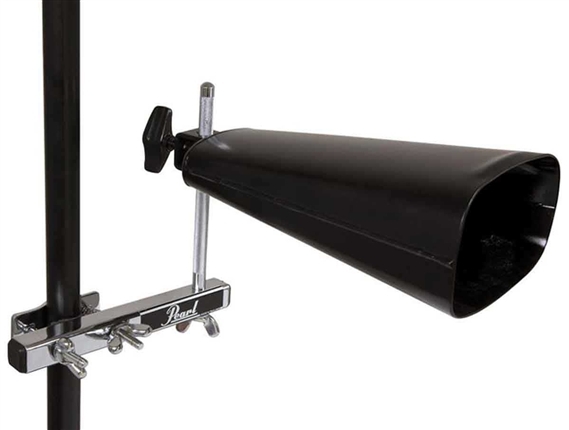 Also included is the PPS-30, a universal percussion mounting bracket that can be attached to stands ranging from 3/4 inch to 1-1/8 inches in diameter. Integrate more percussion into your set. Order today! Not a drummer.. but it rules, it’s a cowbell! I picked this up for my drummer. It’s a large cowbell with plenty of ... well... cowbell! He loves it and I do too! The tone was not very loud ubntil I removed some of the rubber damper inside - then it was OK. Excellent value. I like the hardware that comes with it, I was able to mount my plastic percussion block on it too.